Ever since I was a kid, I’ve loved Batman. The money, the parties, the gadgets! Who wouldn’t love that? To celebrate my love of the Dark Knight, I’ve written out patterns for several miniature versions of the citizens of Gotham City. I’m so excited to share the first one with you! Rnd 10: In dark gray, work 2 sc in each st around. Join and ch 1. Rnd 11: Work 1 sc in each of the next 4 sts, then work 2 sc in next st* – repeat twice. Work 1 sc in each of the remaining 2 sts. Join and ch 1. Rnd 13: Work 1 sc in each st around. Change to yellow, join and ch 1. Use the tail end of the yarn and a yarn needle to carefully sew closed the remaining hole at the base of the doll. Weave in ends. Use the tail end of the yarn and a yarn needle to carefully sew the arms to the doll. Weave in ends. Now you will begin working the mask so that it covers the back of his head but not the front of his face. Rnd 10: sc dec, 1 sc in each of the next 6 sts, sc dec. Fasten off, leaving a long tail. (8 sts). 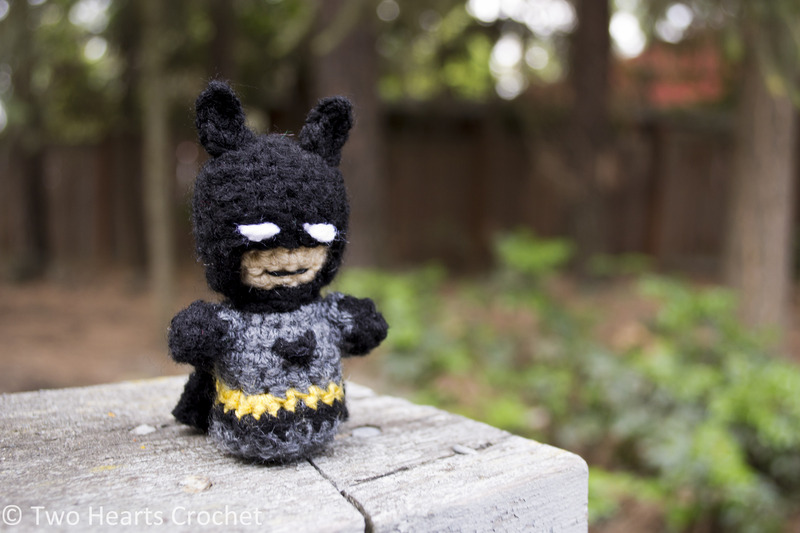 Use the tail end of the yarn and a yarn needle to carefully sew the mask to Batman’s head. If desired, wrap the tail ends of the yarn around Batman’s neck so as to give the illusion of the mask wrapping all the way around him. (If you choose not to do this, it will look as though he has no collar to his costume.) Weave in ends. Rnd 1: In black, ch 4. Starting in the 2nd chain space from the hook, work 1 sc in each of the first 2 sts, then work 1 hdc in the last chain space. Fasten off, leaving a long tail. 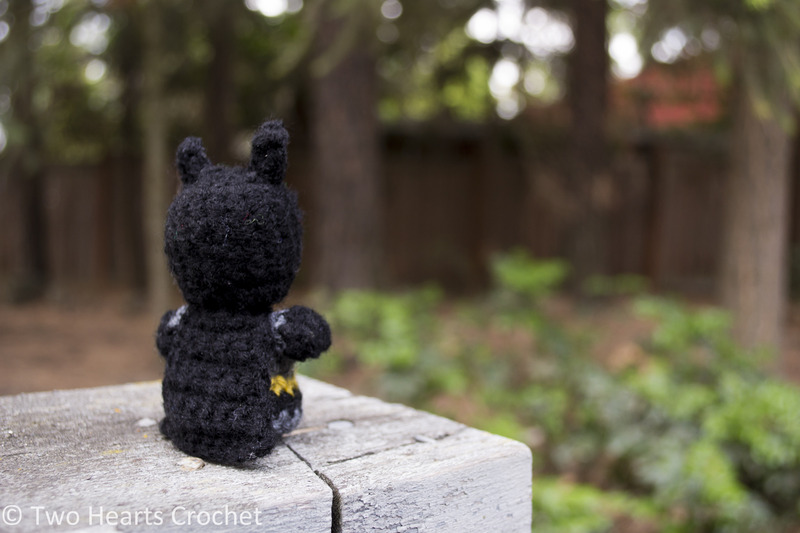 Use the tail end of the yarn and a yarn needle to carefully sew the “Bat Ears” to the top of Batman’s mask. Weave in ends. Using a strand of white yarn (approximately 6″ in length) and a sewing needle, carefully embroider the eyes onto the mask. Weave in ends. TIP: Make these stitches long and flat to give Batman his iconic serious expression. Using a strand of black yarn or crochet thread (approximately 6″ in length) and a sewing needle, carefully embroider the mouth onto the face. Weave in ends. TIP: Try making the mouth one long horizontal stitch to further his iconic seriousness. Use a yarn needle to carefully bring the yarn tail from the lower corner of the cape (where you started the first ch 10 of the cape) up along the side and to the top corner opposite of where the other tail begins (where you finished rnd 8). This should leave you with two yarn tails at either side of rnd 8. 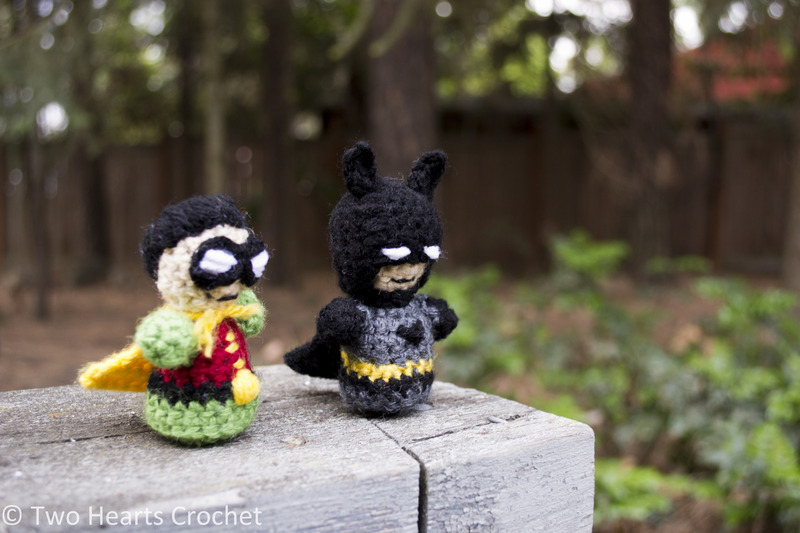 Carefully tie the yarn tails in a knot around Batman’s neck, thus attaching the cape to him. Trim the yarn tails to your desired length. Using a strand of dark black yarn (approximately 12″ in length) and a sewing needle, carefully embroider a small “v” shape onto Batman’s chest. Repeat by working additional stitches over the “v”–this gives it a little extra width but still retains its bat-like “v” shape. Weave in ends. And there you have it! The Dark Knight is ready to face his darkest enemies. Speaking of, stay tuned for the pattern for everyone’s favorite D.C. villain: the Joker! 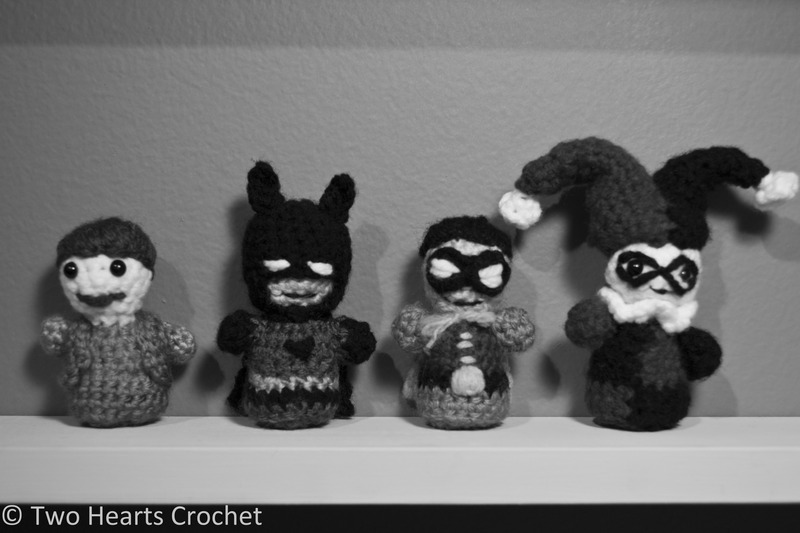 Let’s #CrochetGotham together! Next postComing Soon: The Whovian CAL!